Approximately 3-1/2" height from the bottom to the highest point. CSR's swivel filler neck thermostat housing does it all! Allows you to rotate the outlet in any direction, plus you can now fill your cooling system at its highest point, thereby eliminating trapped air in the system. 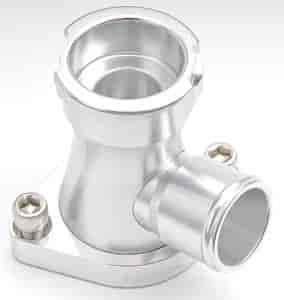 Accepts standard radiator cap (not included) and includes a 1/8'' npt orifice for plumbing an overflow catch can. Anodized billet aluminum housing utilizes an O-ring seal. 914C is rated 4.5 out of 5 by 2. Rated 5 out of 5 by Fattoy from Great price and solved my problem getting air locked in cooling system. Rated 4 out of 5 by T Bucket Jack from Good product, but beware This filler neck looks good and installed easily and did what I needed it to do. However, after about 150 miles it started to leak badly and almost caused me to get stranded. The radiator hose connector was not tight enough in the filler neck. The manufacturer should have tightened it and checked it. I would recommend checking it before you install the filler neck. What is correct cap for this filler ?